This is a mix of police districts. 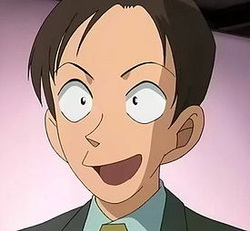 Misao Yamamura (山村 ミサオ Yamamura Misao), also known as Detective Magnum in the English dub, is a character in the manga and anime franchise Detective Conan. Misao is a detective and police officer from the Gunma district, who does multiple things for the district, including robbery cases, escorting criminals, traffic observation, and homicide cases. Later on in the series, Yamamura is finally promoted to an Inspector role, much to the chagrin of Conan and especially Kogoro. Yamaura was born and grew up in the Gunma Prefecture. He became a police detective because he was a fan of Yukiko Kudo's television show in which she played a police woman, Dangerous Policewoman Story. 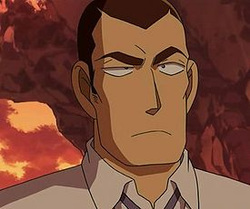 Yamamura, before being promoted to Inspector, was considered a rookie detective. In his first case, he mentioned that the only reason why he was put on the case was because everyone else in his precinct had a cold. Misao's reputation grows after Conan knocks him out to solve a case, which gives him more assignments. Yamamura has a grandmother, named Misae Yamamura, who sometimes gets indirectly involved in Yamamura's cases. She also is a very big fan of racing her own car, and can drive a car as fast as Miwako Sato. 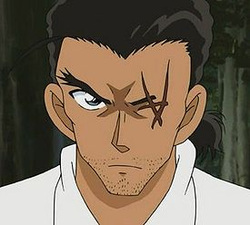 Sango Yokomizo (横溝 参悟 Yokomizo Sango), also known as Inspector Worthington in the Funimation dub, is a character in the manga and anime franchise Detective Conan. Jugo Yokomizo (横溝 重悟 Yokomizo Juugo), often referred to as the same name as his twin brother, Inspector Yokomizo, is a character in the manga and anime franchise Detective Conan. Jugo is the younger brother of Sango Yokomizo, who is also an inspector from Kanagawa police district. Both started their police career in Saitama, but some time later Sango transferred to the Shizuoka district. However, they do stay in touch and have even assisted each other in various (and even locally unrelated) cases. Kansuke Yamato (大和 敢助 Yamato Kansuke) is a police inspector from Nagano Prefecture. His direct subordinate is Detective Yui Uehara. Yamato lost his left eye in a snow avalanche and now has an X-shaped scar in it's place. This same avalanche caused severe and permanent damage to his left leg, forcing him to use a forearm crutch to walk around. Yamato grew up in a small Nagano village with Yui Uehara. Like most people from the village, he greatly admired police officer and town hero Kuroto Kai, who inspired him and Uehara to join the police. One year before the Fuu Rin Ka Zan Case, Yamato chased a parole jumper he believed to be involved with Kai's mysterious death into a mountain, where he got caught in the avalanche that took his left eye and leg. He was missing and believed dead for several days until school friend Taka'aki "Koumei" Morofushi, also a police inspector, went against orders to track down the criminal and find Yamato. After recovering, he returned to the force and resumed working on solving Kai's death. 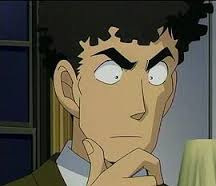 With the aid of Conan Edogawa and Heiji Hattori the case was finally resolved, and soon afterwards Uehara rejoined the police force as his partner. 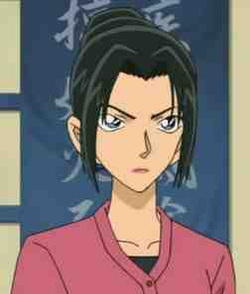 Yui Uehara (上原 由衣 Uehara Yui) is a character in the manga and anime franchise Detective Conan. Yui Uehara and Kansuke Yamato grew up together in a village in the Nagano prefecture. One day, the popular village policeman and kyujitsu master Kuroto Kai died under mysterious circimstances, prompting Yui and Kansuke, who had joined the police force following his example, to investigate the case. When Kansuke was critically injured and believed lost in an unrelated case (thus gaining him his damaged leg and his trademark scarred eye), Yui decided to carry on the investigation by herself, quitting the police force and marrying into one of the families she suspected of having murdered Kai. 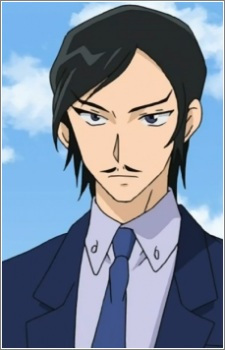 Taka'aki Morofushi (諸伏 高明 Morofushi Taka'aki), more commonly known as Komei (孔明 Kōmei) is a character in the manga and anime franchise Detective Conan. Morofushi and Kansuke Yamato were both students at the same elementary school, which is where the two met. Morofushi's exploits were so well known that a book about a child who solved a case in a elementary school, titled "Komei-kun from Second Second Grade Class A!" was based off of him, while another character in the book was based off of Yamato.Morofushi cherishes the book, keeping it in the glove compartment of his car, as the author was a friend of his who died. He was originally a high ranking inspector in Nagano, until he abadoned his job briefly to try and find Yamato when he was left for dead in the snow during a case. After Morofushi found the suspect, and helped save Yamato, he was downgraded as an inspector in a local force in Nagano. In episode 653, it is revealed that he has effectively returned to the main headquarters.